With the last remaining part of the main station building constructed in styrene and clad in brick sheet we were now able to fix all the separate sub-assemblies together. 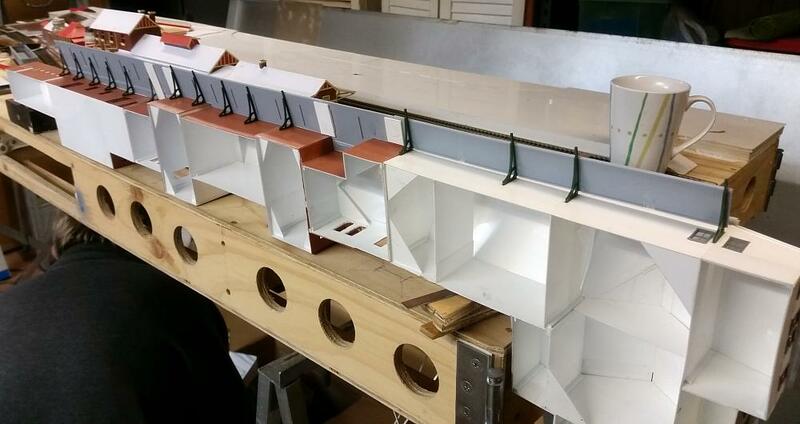 This makes for a very long structure that is 1.12 metres long in HO scale. The main station building structure lying on its side (the side that the public will see is face down) and the platform side awning is starting to be fixed in place. Construction of the long platform side awning was now able to commence. We used the awnings and awning brackets that we had leftover from the AMRI Station Building kits. These kits were used previously to construct the island platform station buildings. After measuring to get our awning heights right we pencil marked the walls of the station building where the awning would sit. This was tricky to do due to the station building walls not all being aligned along the length of the platform, as per the prototype. A few of the awning brackets were fixed in place at critical locations and the awnings were fixed in place, gluing them to both the brackets and the walls. Any joins in the awnings were strengthened with styrene splice pieces on the underside. After the full length of the awnings had been fixed in place we went back and glued in place all the remaining brackets that were required. A detail view of the country end of the platform side awning showing how it sits on the angled brackets against the station building walls. Some of the awning brackets projected past the front edge of the awning, so we trimmed those off with flush-cutting side cutters. Beneath each of the awning brackets we then fixed a piece of styrene with a rectangular cross section - this went from the underside of each awning bracket to platform level. This is to represent the steel awning supports on this platform at Goulburn, as they are supported on footings beneath the surface of the platform and travel up and sit flush with the station building walls. These styrene pieces and the awning brackets themselves will all be painted a cream/yellow colour as per the prototype. A view of the station buildings as viewed from the backdrop side (minus the backdrop). The long awning to platform 1 and all the supporting angle brackets have been fixed in place. 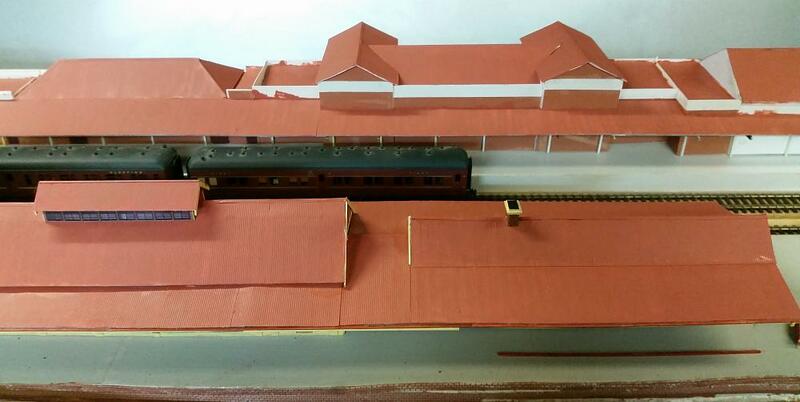 Now that all components of the station building were assembled and the platform side awning installed, we clad all parts of the building roofs and awnings in corrugated cardboard. All the roofs and awnings were then given 2 coats of paint in Heritage Red. A view of the station buildings almost ready to be fixed in place on the module as viewed from the backdrop side (minus the backdrop). A couple of passenger cars are sitting on the Up Main.